At a recent Platypus panel in Toronto one of the panelists concluded by noting that the left was haunted by its past. Here in North America I agree that we are haunted by our past, but maybe not in the way that panelist meant. The past lingers as a ghost because we fail to understand its meaning; we generally refuse to make sense of our successes and failures. Sometimes we see successes where there are none, other times we only see failure. We often refuse to grasp the precise nature of those world historical revolutionary successes––hard won by the sacrifices of the oppressed––just as we refuse to grasp the whys and hows of these revolutionary failures. Hence we are haunted by a general myopia when it comes to organizing against capitalism in the US and Canada. For the past decade and a half I have attended or participated in numerous activist and academic panels where there has been a general resistance to concretely assessing how to organize a revolution. Seeing only the eventual failures of the Russian and Chinese revolutions, all of the successful methods of organizing that produced these revolutions are treated as a part of the failure. Simultaneously there is a fetishization of nebulous movementist solutions where the movement is everything, the goals will emerge spontaneously, and a multiplicity of trajectories will magically add up, at some unspecified moment, apocalyptically toppling capitalism. But this search for a new method of revolution, or a new militant organization is not new, and we would know this if we were not blind to the past. Even still, we keep trying to invent new wheels, haunted by blueprints that were flawed to begin with. When the ruling classes are now responding to their crisis with austerity measures, large sectors of the mainstream left at the centres of capitalism are once again embarking on the same movementist attempt at resistance. 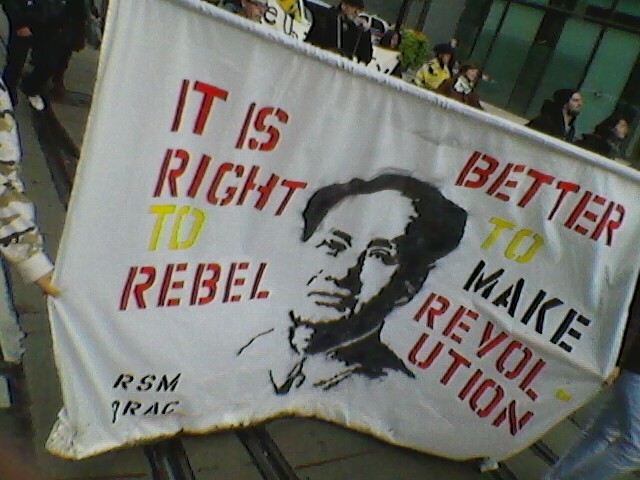 Large-scale movements, most recently “occupy”, demonstrate legitimate anger and the fact that it is right to rebel. 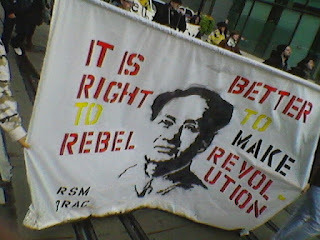 But again, as with the anti-globalization movement of the 2000s, there is a resurgence of similar strategies and tactics––a movement without any theoretical or practical unity beyond a few slogans, the need to resist, and the belief that a lack of demands and a lack of clear strategic direction is a strength. Discussions, speeches and panels eerily similar to those of the collapsed anti-globalization movement abound. As Louis Althusser once said, we are asking the wrong questions for the right answers. The right answer is, of course, that capitalism needs to go. The wrong questions are in the hows and whys. A few years ago, myself and several others from english-speaking Canada found ourselves disaffected by this movementist approach. Some of us (like myself) were coming out of a protracted strike where, working in the ranks of a radical union movement, we were trying to fight the climate of austerity represented by the casualization of our labour. Others were growing disaffected by exhausting and multiple left movements (i.e. the anti-war movement, anti-poverty groups, radical migrant action, anti-racist initiatives, radical queer and trans organizing, pro-Palestine solidarity, etc.) that often lacked any concrete theoretical unity. We were drawn back to the revolutionary theorists of the supposed “failed” and world historical revolutions, to the work of Lenin and Mao, now interested in how they had succeeded before failing. Some of us were already familiar with these traditions but were beginning to realize there was a gap between our theory and practice––and in this gap the haunting of the past, an inability to properly respond to the objective circumstances of the crisis. It was in this context that we were drawn to the Revolutionary Communist Party of Canada [PCR-RCP] that, at that time, was based solely in french Canada. What we saw was an organization that was theoretically unified, that was humble, that was providing a thorough and exciting assessment of Canadian capitalism, that was growing as it organized in proletarian spaces, and that was working with militant anarchist movements without the disdain common amongst other communist groups who preferred to avoid direct action––who focused primarily on trade unions and reformist agitation. And so, after a few of us attended the 2nd Canadian Revolutionary Congress in Toronto in 2010, and were impressed by the PCR-RCP’s vitality, we were moved to support this organization and thus began thinking of what it might mean to push a revolutionary rather than activist agenda––and to do so not as a dogmatic ideological grouplet, like so many marxist missionary parties, but in a way that was relevant, humble, and principled. What was most exciting about the PCR-RCP’s approach, however, was that it did not seem haunted by the past––either unwilling to simply apply dry formulas or search for supposedly “new” movementist solutions––but was applying universal concepts of organizing creatively to the particular context of Canada. But this context is also a context of default opportunism where the mainstream left and organized labour have, for a long time, abdicated revolutionary responsibility. And in Canada, which has a much more developed welfare capitalism than the US, this has resulted in complacency and a social democratization of our politics. But now that this default opportunism has been subjected to a climate of austerity, the political is confused––a vague movementism is the knee-jerk solution. This is a context where organized labour is merely fighting to hold unto welfare reforms, where the Canadian social democratic party (the NDP) drifts further rightwards each year, and where more and more people are becoming proletarianized. In this context the mainstream left spends much of its energy around preventing claw-backs, but we would like to ask why communists and anarchists now feel the need to work on projects that social democrats would do anyhow––don’t the masses deserve more from us? And in this context, the most recent rebellions, such as occupy demonstrate a desire to rebel, perhaps even a desire for revolution, but we would like to ask whether this rebellion is enough. In some ways this rebellion, at least in Canada where it has already petered out, was symptomatic of a once privileged sector of people who are being pushed down into the ranks of the proletariat. The normative response is an angry movement that wants to reject the current climate but generally, and this is its supposed strength, rejects theoretical and practical unity just as it refuses to declare its aims. We must remember that the slogan “the final aim is nothing, the movement is everything” was also Eduard Bernstein’s slogan. Thus in this climate of austerity we agree that it is right to rebel… But, because we do not want to be crushed, we would like to add: it is better to make revolution.